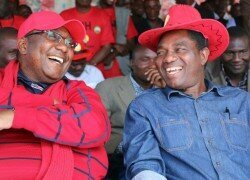 POLICE on the Copperbelt have summoned opposition United Party for National Development (UPND) leader Hakainde Hichilema and his vice-president Geoffrey Bwalya Mwamba for allegedly holding an illegal meeting in Mpongwe district on Saturday. And Mpongwe District Commissioner Keith Maila yesterday lodged a complaint against Mr. Hichilema in Luanshya for allegedly inciting the general public in Mpongwe to rise against the Patriotic Front (PF) government. Mr Hichilema and Mr Mwamba have been summoned by Luanshya Police and the duo is expected to report to the police station on Wednesday next week. Copperbelt Police Commissioner Charity Katanga confirmed the development in an interview in Ndola, stating that the public meeting the two had called for was illegal and had not been permitted by her office. Ms Katanga said Mr Hichilema and Mr Mwamba had not followed the law of notifying the police about their assembly which was a breach of the Public Order Act. Ms. Katanga said summons had been delivered and the two were expected to report themselves to Luanshya Police on Wednesday this week but that Mr Mwamba was not available at the time. “Yes, I can confirm summons have been issued regarding the purported meeting in Mpongwe by Mr. Hichilema and Mr. Mwamba because we had no knowledge of such taking place in the area. “Mr Hichilema and Mr Mwamba were expected to report to Luanshya Police on Wednesday this week but Mr Mwamba was not available, so we have asked them to report to police on Wednesday next week. We have deferred it to next week Wednesday and it is expected that they appear before police in Luanshya,”Ms Katanga said. Meanwhile, Ms. Katanga has advised Mpongwe District Commissioner to report Mr Hichilema to Luanshya Police station for allegedly inciting the people in the area to rise against government. She said according to reports received by her office, Mr Hichilema and Mr Mwamba addressed a gathering in Mpongwe at which they were reported to have asked them to rise against a legitimately elected government. Ms Katanga said Luanshya was a control station for Baluba, Masaiti and Mpongwe, hence offences committed in the jurisdiction must be reported to responsible offices. Ms Katanga explained that Mr Hichilema told the people of Mpongwe not to recognise President Lungu and that they should begin rejecting government officials as well as programmes. According to reports lodged at Kitwe Police Station Mr. Maila alleged that on Monday 26th September, 2016, Mr Hichilema together with Mwamba held a meeting in Mpongwe where he asked residents in the area not to recognise President Edgar Lungu as a legitimate Head of State. He further alleged that Mr Hichilema also called on residents to reject any official government programme in the district.